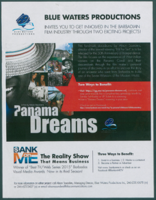 Blue Waters Productions Invites You to Get Involved in the Barbadian Film Industry through Two Exciting Projects! Panama Dreams. Bank on Me.